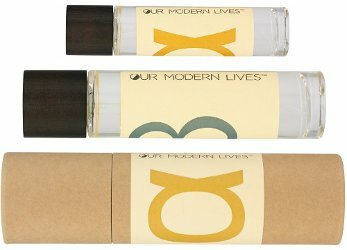 If you're a fan of indie perfumer Sarah McCartney, creator of 4160 Tuesdays, you may already know that she recently introduced a new collection called Our Modern Lives. The collection includes seven all-natural botanical perfumes named for colors and moods, plus two synthetic, hypoallergenic fragrances that can be worn alone or layered with the naturals. It's an ingenious concept. With this collection, we're able to choose or combine at will. I'm slowly working my way through Our Modern Lives' spectrum of natural fragrances; at the moment, Red (whose mood is "Gratitude" and theme is "Harvest") is my favorite. It's "a collection of rich red fruits with nuts, grains, hay and rose," with ingredients like essences of pink peppercorn, pink grapefruit, hazelnut, hay, rose, raspberry leaf, oakwood, labdanum, wine and davana. I'm not sure how to categorize Red, since it's equal parts fruity, woody and floral: it really does feel harvest-y. It's a cornucopia of mellow notes like dried cherries, roasted nuts, red wine and woodsmoke, with just a hint of citrus and pepper to keep things from getting too heavy. I've also tried OML's two synthetic blends, Alpha (α) and Beta (β), in conjunction with Red to see what effects they produced. Alpha is a "mild amber woody fragrance, made with seven synthetic materials" and Beta is "a soft musk with the feel of outdoor freshness and white woods." As standalone fragrances, they are very different. Unfortunately, Alpha turned out to be a "scrubber" for me; it's a transparent woody amber, but it wasn't "mild" on me — instead, it felt as sharp as a glass knife to my nose. I like Beta much more; it's an unobtrusive, gender-neutral, cool white musk. I tried layering Red with both synthetic blends. With Alpha, Red's fruit notes came through more distinctly, but I was so agitated again by Alpha's piercing synthetic woods that I didn't get far with this combination. A layering of Red with Beta was much more successful for me. Worn alone, Red lasts about two hours on my arm. Paired with Beta (the order of layering doesn't seem to matter), Red feels a little more diffusive, and its rose-y and sweet aspects are more apparent. Best of all, it's still noticeable on my skin seven hours after I applied it. McCartney tells us, "There are two things which our customers ask for over and over: 100% natural fragrances, and scents with no allergens. Often they imagine they will automatically find both in the same bottle. That's rarely going to happen." By providing both — separately, with clear explanations — she's helping to demystify this issue. And after my focused sampling of Red with Alpha and Beta, I'm looking forward to trying Beta with Yellow, Orange, and other shades of the OML spectrum. I may also wear Red alone when I want just a hint of scent or I know my mood or my activities may require another fragrance later in the day. Choice! Very modern, indeed. Our Modern Lives Red (Harvest/Gratitude) is available as 10 (£30) and 50 (£95) ml Eau de Parfum and 100 ml (£48) Eau Fraîche. Alpha (α) is available as 50 (£60) and 100 (£90) ml Eau de Parfum, and Beta (β) is available as 50 (£40) and 100 (£60) ml Eau de Parfum via the Modern Lives website. I tried out alpha and it was also very sharp on me. I tucked back in the back of the closet but might try it out layering. Hi Scott! Maybe you’ll have better luck with it as a layering element! Too bad…a soft woody amber would be great to have, for adding depth and longevity to citruses and light florals. Jessica, have you tried Blue by any chance? Hi Schaf, I’ve tried Blue/Horizon once so far! It was vetiver-heavy on me and had decent staying power. I’m hoping to pick up on more of the notes next time I try it! Excellent! Thank you for the review. I would love to try these and hope they will make an appearance in the US retail market one way or another. I struggle with the “glass knife” (a perfect description) as well as migraine from some new releases and from some new iterations of old perfumes. I have a newer bottle of 24 Faubourg I must love from afar (sobs quietly into a scented hankie). It seems sandalwood, rose, vetiver, and patchouli notes might be to blame, but who knows what’s in the perfumes? Not me certainly, so it’s a guessing game. I try new scents very liberally before I buy. Tester bottles are my fragrant friends. Hi Tiffanie! I’ve been lucky to have had *very* few allergic reactions or other physical discomforts caused by fragrance over the years… although there are certain ingredients that make me feel a bit queasy (and many notes that I just don’t enjoy wearing, of course!) but as you say, testers are our friends!! And it’s so hard to guess from lists of “notes” what the actual culprits may be. I’m so sorry 24 Faubourg is on your “avoid” list now!! alas.